It is, frankly, exhausting to keep up with whether eggs are healthy; the verdict seems to change by the minute. Just ask the Time Dietician. Eager for a definitive answer and feeling a little hungry, we reached out to Cathy Ricker, a clinical dietician at Jefferson University Hospital. A good starting point: What are some of the known-to-be-healthy elements of eggs? Protein and amino acids, I'd guess? Eggs provide 75 calories, 7 grams of high-calorie protein and 5 grams of fat, with 1.5 grams saturated fat. They are full of essential vitamins and minerals — including iron, vitamin A, vitamin B12, folate and carotenoid which is very good for the eyes. The bigger question: What's the deal with eggs and cholesterol? The conclusion on the subject seems to oscillate by the year, and it's hard to keep a check on what's current. The consensus is to eat eggs, but like any food, you need to eat them in moderation. Eggs do have a small amount of saturated fat, which does not outweigh the health benefits. The cholesterol in an egg has almost no effect on our blood cholesterol levels. Your cholesterol levels are more affected by the saturated fat in your diet. If you are trying to limit cholesterol from your diet, you can remove the yolk from the eggs. • Eggs have minimal impact on blood cholesterol levels. But, there is a small amount of saturated fat. So, just don't go too egg-crazy. • No, you can't prevent salmonella by "washing" your eggs. • There is no nutritional benefit to adding raw eggs to smoothies. • Hard-boiled is the healthiest way to eat an egg. Is it more that we prepare eggs with other, worse things, and that's why eggs sometimes get a bad reputation? Yes, the way you prepare an egg could negate all the positive health benefits of an egg. You want to be mindful of how much butter or oil you are using to cook the egg, as well as how much sodium you’re consuming when you top it with salt. What's a healthy, ideal way to prepare an egg? If you’re looking for the healthiest way to prepare an egg, stick to hard-boiling them. Poaching is also another healthy way to cook eggs. Is it, perhaps, not recommended that we eat as many eggs in one sitting as we do? For example, I've heard that seven eggs a week is acceptable, but if we're eating a three-egg omelet and getting half of those eggs in a single sitting, maybe that is not recommended? What is the difference between wine and grape juice? Like everything else, moderation and variety are the keys to a healthy diet. So yes, eating seven eggs at once is not a good idea, but eating eggs a few times a week is acceptable. When making an omelet, you can remove one to two of the yolks and add veggies to make your meal more nutrient-dense. "Eggs" is kind of a catch-all, but does it matter what animal the egg is coming from? Is a quail egg offering the same nutrients? All eggs are about the same — caged versus uncaged, brown versus white. A quail egg offers the same calories, protein and fat—it may have slightly different vitamins than a chicken egg. Does the nutritional information you gave apply to a medium-sized egg or a large-sized egg? The nutritional information applies to a medium-size egg, but larger eggs have a minimal nutritional difference. Is all of that nutritional content retained when you're using it as part of a recipe? So, let's say you're baking a cake and it calls for three eggs. The nutritional value remains the same. Actually, it is better to cook the egg for better protein digestibility. Lots of folks bravely throw egg whites into a shake or smoothie. Is that actually safe? Or, don't know if you've noticed, but a lot of cocktail recipes at bars lately have an egg white. There is no benefit to eating a raw egg. It puts you ask risk for foodborne illness salmonella. Trypsin is an enzyme in our body that helps in digestion. A raw egg may block this enzyme, thus possibly reducing the nutrition value of the egg. 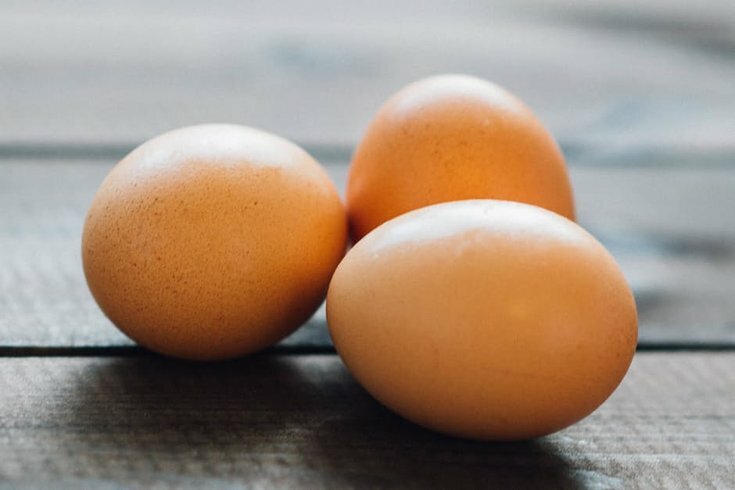 When the egg is cooked, it breaks down the egg enzymes that could potentially block trypsin, thus allowing trypsin to break down the egg’s protein during digestion. Any fun egg facts to add? Buying an egg from a farmers market or supermarket does not make a difference in an egg’s nutritional value, and you cannot prevent salmonella by washing the egg shell!